Needs some ‘hacks’ as current version of the API doesn’t have enough events to supply custom URL before it is loaded. But check latest version of mapbox, it might have better support for this. Another issue is that WMS server has to provide HTTP header with Access-Control-Allow-Origin:* to avoid WebGL CORS failure when loading image (gl.texImage2D). Usually WMS servers don’t care about this, as for normal img tags CORS doesn’t apply. Here WebGL has access to raw image data so WMS provider has to explicitly agree with this. Build process of mapbox-gl-js tend to be as many other large js projects complicated, slow, complex. And specifically on Windows platform it is more difficult to get mapbox-gl-js install and build running then on Mac. // -- we have to patch sourceObj.url, dirty ! pixi.js is a 2D open source library for gaming that includes WebGL support for primitives rendering. 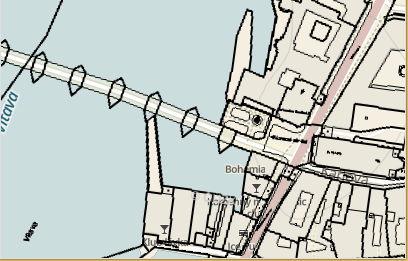 Why not to utilize it for polyline renderings on map ? It turned out, however, that the tesselation of the polylines is not handled well. Another implementaiton of polyline tessellation (seems like more functional) is in mapbox-gl-js in LineBucket .Mapbox-gl-js code took quite more time to get it running and debug on Windows platform,I had to run npm install from VS command shell and read carefully what all the npm errors are saying (e.g. Python version should be < 3). Then FireFox for some reason haven’t triggered breakpoint on LineBucket.addLine, this took another time to find out that I should debug thi s rather in Chrome. See the blog here.Anyway good experience with all the messy npm modules, their install requirements and unnecessary complexity. Also all the npm modules takes more than 200 MB, but some of them are optional in the install. After all basic LINE draw in WebGL (without the thicknes and styling) is useful too, as on picture above you can see railways in CZ city Ostrava.